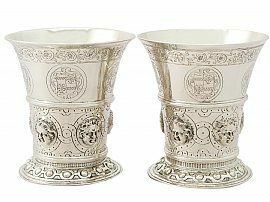 These antique Austro-Hungarian silver beakers have a tapering cylindrical, flared form onto a circular domed foot. The lower portion of each beaker is encompassed with interlacing engraved decoration incorporating six impressive embossed figural mask designs. The beaker is encircled with an applied girdle below circular cartouches displaying a variety of engraved coat of arms; one set of heraldic marks incorporates the initials 'K' and 'P' separated with a dart. 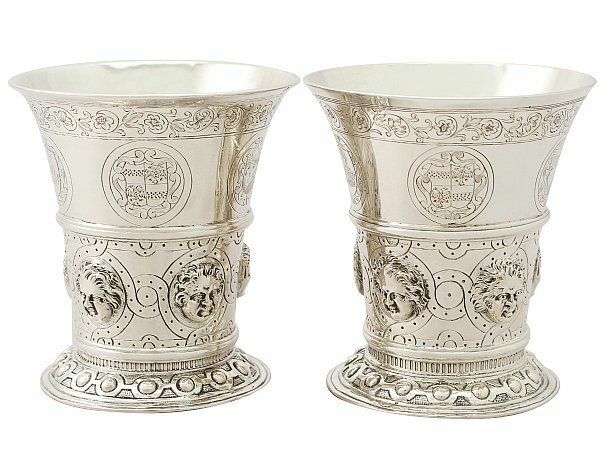 These antique beakers are further ornamented with an engraved band of scrolling leaf and floral motif decoration to the upper rim. The spreading foot is embellished with a band of chased circular motifs with convex bead designs to the centre of each. These antique Austro-Hungarian beakers are a very good gauge of silver, excellent quality and in exceptional presentation condition. The hallmarks struck to the surface of each rim have wear in keeping with age and location, but remain legible.